Tyler Warren RPG Battlers Pixel-Style 2| RPG Maker | Create Your Own Game! 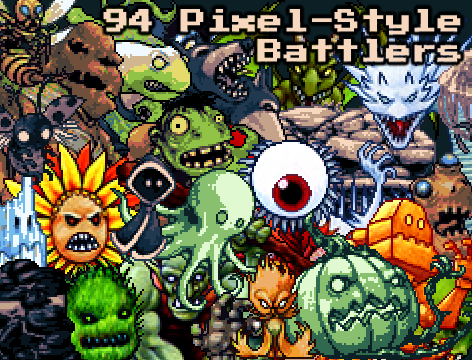 In response to many requests for more retro-pixel graphics needed by RPG game makers, Tyler Warren has completely remastered his monster collection in this 2nd of 3 pixel-style graphic packs. This pack is a careful assortment of 94 of Tyler’s battlers recreated in a pixel art style, presented in 7 different color palettes and 4 sizes, for an impressive total of 2,632 graphic image files in one pack. If you are working on your retro or pixel game these are the monsters you need! 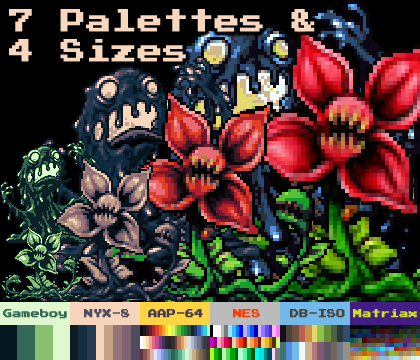 94 of Tyler Warren’s monster battlers recreated pixel-style in 7 color palettes and 4 zoom sizes (2,632 image files). Provided color palettes can help you select the overall look for your game. Files are provided in 4 zoom sizes, from 1X to 4X . This is pack 2 of 3, which together will recapture almost all of Tyler Warren’s battlers in pixel-style. Add these to Tyler’s other battlers and fill your library with hundreds of exciting characters to use in your next RPG Maker Project and beyond!